Filters Plus supply fuel filters that provide clean, filtered fuel to prevent injector clogging, pump wear, and premature engine wear. Backed by leading global filtration specialists, our comprehensive range of products comes in a variety of styles, sizes and materials to suit commercial and industrial applications. Our primary fuel filters feature water removal capabilities that remove water and other contaminants from the fuel system before it gets to the pump; this ensures longer diesel injection system life and productive engine uptime. 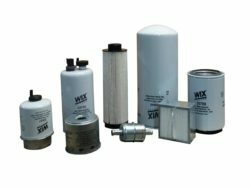 Meanwhile, our secondary fuel filters provide high efficiency particulate filtration and innovative filter media and system solutions. Whether prefilter or main filter, Filters Plus offers a wide variety of fuel filtration products for virtually any application. Boost the fuel efficiency, longevity and performance of your engines — chat to our team to find the best fuel filters at the best prices.